AT LAST, a complete start-to-finish book on creating countertops from the most versatile material available. One of the most widely used and durable construction materials in the world, concrete can also be formed into both simple and complex shapes, based on the needs and the design expectations of the homeowner. in designer Fu-Tung Cheng’s hands, concrete becomes a wondrous medium for creating one-of-a-kind countertops for your kitchen and bath. THE POSSIBILITIES for creative expression with concrete are endless. Unlike traditional countertop materials, you can color, polish, stamp, and stain concrete. You can imbed objects in it. It has substance and mass, permanence and warmth. The spectacular photos finished countertops throughout the book explore the many design possibilities of concrete countertops. CHENG TAKES US STEP-BY-STEP through the process of making a concrete countertop, from building the mold, mixing and pouring the concrete, to curing, grinding, and polishing, and, finally, installing the countertop. Along the way, Cheng also offers valuable troubleshooting advice and useful tips on maintaining a concrete countertop. At first, the idea of using concrete for kitchen countertops has the same appeal as using cardboard boxes for cabinetry or dining on the floor. Naysayers are in for a surprise as architect Cheng elevates this pedestrian building material to a new level, using it to create beautiful and functional countertops. They are a far cry from rough sidewalks, having polished surfaces that can be colored or have interesting objects cast into them. Cheng shows the entire process: design considerations, mold-making, concrete selection, installation, and maintenance, all using straightforward instructions supplemented by excellent illustrations. Showing an innovative use of a common and inexpensive material, this title should be part of comprehensive public library home improvement collections. Fu-Tung Cheng is known internationally for his sophisticated and innovative concrete designs for the home market. He heads the Berkeley-based Cheng Design, a firm that also produces prized kitchen ventilation units and GeocreteTM, a boutique line of sculptural concrete countertops. 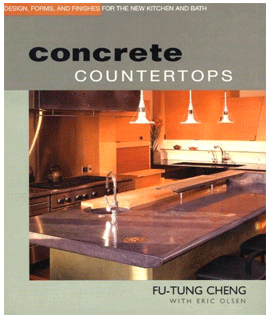 Cheng was the author of Concrete Countertops, the book that launched the concrete countertop revolution. Eric Olsen is a journalist. He has published hundreds of magazine articles, a few short stories, and six nonfiction books. Olsen directed the International Institute of Modern Letters, a literary think-tank that helped writers who were victims of censorship, and created the first American City of Asylum, in Las Vegas. He was also the executive editor at Time Inc. Health, a Time Warner company. He is a graduate of the Iowa Writer’s Workshop. He lives in Las Vegas.